A search of APImages.com for Sen. 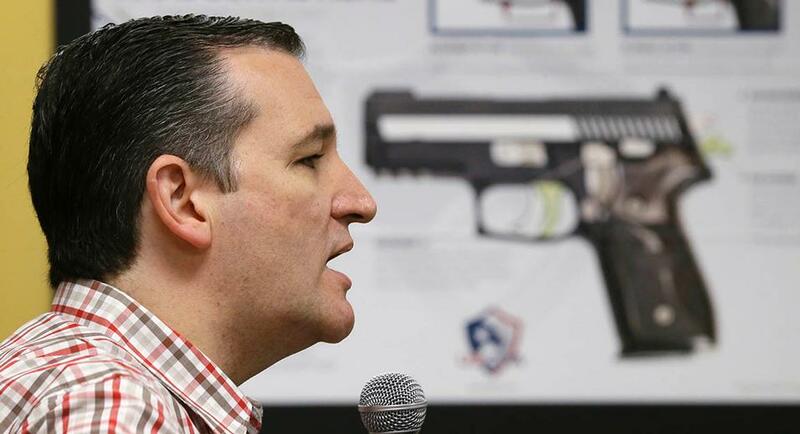 Ted Cruz (R-TX)93%  no longer yields a handful of photos from photojournalist Charlie Neibergall wherein the barrel of a gun on a poster points to the U.S. Senator and presidential candidates head. UPDATE: AP Vice President and Director of Media Relations Paul Colford confirms that the news organization has decided to prevent future licensing of the photos showing guns pointed at Cruz. So now they’re thugs AND cowards! At least now I know the name of the ghoul that took the picture. I look forward to seeing his name in the future. The AP was busted. They thought to brainwash people subliminally, but they ended up pointing the gun to their own head. Their bias became public to the whole world with this one photo. They do say a picture is worth a thousand words. In this instance, a biased picture was worth a thousand biased articles. I want to thank the AP photographer from giving us such a wonderful illustration of what the AP is all about! Was this the same guy who captured the “halo” around Obamas head? This is not just AP. AP is owned by the major publications. This is the liberal biased media. AP got its point across, and afterwards quietly removed the picture. AP = All Propaganda. Don’t be concerned, AP will continue their un-journalistic ways. The photographer will get a quiet under the table bonus. Nothing will change with their corrupt culture. This alone tells you Cruz is on the right path. For the state/Arab-controlled msm to be this brazen in such a anti-gun, PC world, says volumes about how much Cruz bothers the status quo. What is bad for the left is good for America. AP must think we have no memory at all! Not that we can do anything about them...except avoid publications where they are the news source. They can remove it from their site but it’s out in the internet void and will always be there. I bet there will be a lot of remakes of that picture. The only think AP can do is cry and say it’s a copyrighted picture. This is how cowards on the left hope to inspire nutjobs to act. This was not an accident. Note the framing of the photo. A well-framed photo would center on Cruz. It does not. Cruz occupies only half of the photo. The firearm pointing at his head occupies the other half. This is 100% fully-aware intentional. And this is what they WILL do, the left, at some point. First, they come for the guns. Then, they come for your property. Then, they come for your life. The left is of Satan. Trav: Time is very short. C’mon people, give credit where due: regardless of how it got taken & published, AP had the sense to remove the image entirely. In a large organization there are idiots who do stupid things; respect to the managers who undo the damage insofar as they can. Remember, this is vs numerous other comparable images from various sources that were defended with “so what?” instead of removed. Here is credit where credit is due: I like the Hillary picture better. "Cmon people, give credit where due: regardless of how it got taken & published, AP had the sense to remove the image entirely. In a large organization there are idiots who do stupid things; respect to the managers who undo the damage insofar as they can. Remember, this is vs numerous other comparable images from various sources that were defended with so what? instead of removed." I would suggest that exactly ZERO credit is due. It's like saying "with all due respect" which when referring to the left I follow with "and there's none due". In a nutshell they removed the pictures because they got caught, not because they are trying to do the right thing. If it were the latter those "managers" would have stopped them from being published in the first place.